The all-new compact VITA SMART.FIRE chairside furnace is ideal for crystallizing, staining, glazing and corrective firing with ease. Designed specifically for dental practices, VITA SMART.FIRE features pre-installed programs along with customized material-specific options for simple firing. Just touch and fire! Complete to qualify for SMART.FIRE offer! 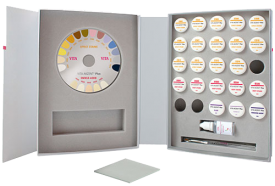 Now for a limited time, get a FREE VITA AKZENT Plus stain and glaze kit with your SMART.FIRE purchase – a $1400 value! With VITA AKZENT Plus, you can enhance the shade of all types of dental ceramic restorations simply and efficiently. When adding internal coloration, surface characterization or fine glazing, VITA AKZENT Plus fluorescent stains adapt your restoration quickly. *Valid in the United States and Canada only for purchases made between October 1 through December 31, 2017. Promo Code: CLINICAL17. Email invoice to promo@vitanorthamerica.com. Invoice must be submitted no later than January 31, 2018. Proof of purchase on one invoice is required. Free goods will be shipped directly from VITA North America. Offers may not be combined with any other promotion or discounts. VITA North America reserves the right to discontinue or change offers at any time without notice. No cash value. © 2017 VITA North America. VITA SMART.FIRE and VITA AKZENT are registered trademarks of VITA Zahnfabrik.